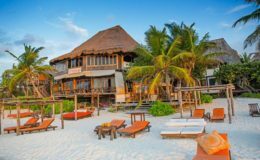 Tulum is one of Riviera Maya's most popular beach towns, featuring endless beach clubs, laid-back atmosphere, historic ruins, azure blue Caribbean coastline, and great food. 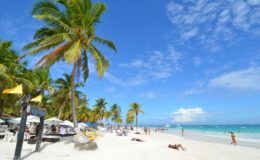 Although Tulum's popularity is increasing among foreign tourists, it remains quieter than nearby destinations, Cancun and Playa del Carmen. 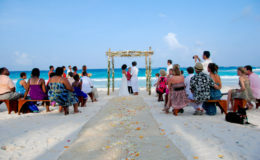 It is located about 40 miles south of Playa del Carmen and 80 miles south of Cancun. This happy little village in the middle of the Mayan Riviera is a great place to explore Mayan history and discover the popular swimming and snorkeling spots – cenotes. 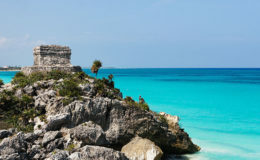 Exploring Mayan Ruins: Tulum contains the most picturesque archaeological site in the Riviera Maya, where you will find impressive structures built on a cliff overlooking the Caribbean Sea. 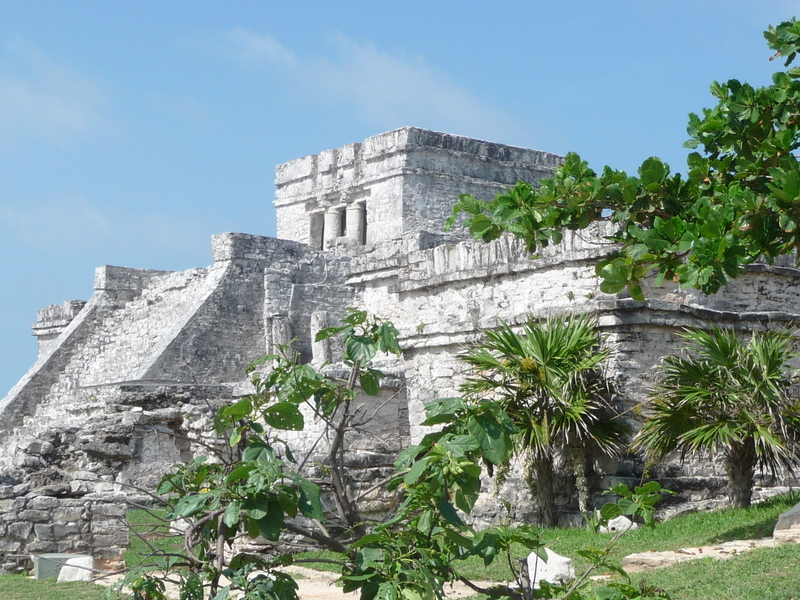 It’s best to arrive early to explore the ruins at Tulum. 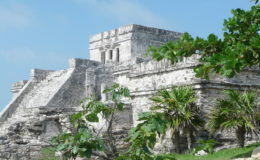 Castillo is the most ancient Mayan structure that sits atop a limestone cliff. You will get amazing photography opportunities as this structure overlooks spectacular turquoise waters and is surrounded by palm trees. This type of architecture is also found in the nearby Chichen Itza. You can make a day trip to Chichen Itza to explore its Mayan temples and pyramids. 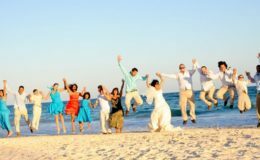 You can also combine the Tulum Mayan ruin tour with another popular Mayan site, Cobá, where you can discover stone causeways of the ancient Mayan world, and many engraved and sculpted stelae. Visit Las Pinturas, an ancient 85-foot pyramid which was once a sacred Mayan temple, to see the famous stucco paintings on the wall. 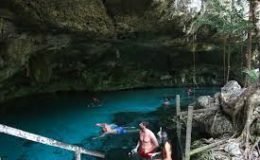 Swimming in Cenotes: Tulum is famous for its cenotes (which are fresh water sink holes that result from the collapse of limestone bedrock). 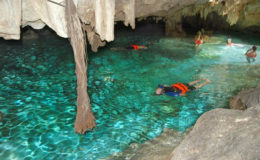 These natural pools are sacred to the Mayans and are believed to have healing properties in the water. 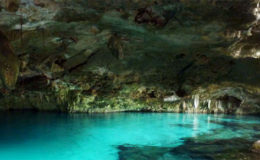 Visitors can explore some of the famous cenotes in and around Tulum by swimming, snorkeling and diving expeditions, including Cenote Dos Ojos, El Gran Cenote, Cenote Calavera, Cenote Carwash, Cenote Escondido, Cenote Esqueleto, and Cenote Sac Actun. These spectacular natural sinkholes are home to wonderful stalagmite and stalactite formations, and boast freshwater marine flora and fauna. 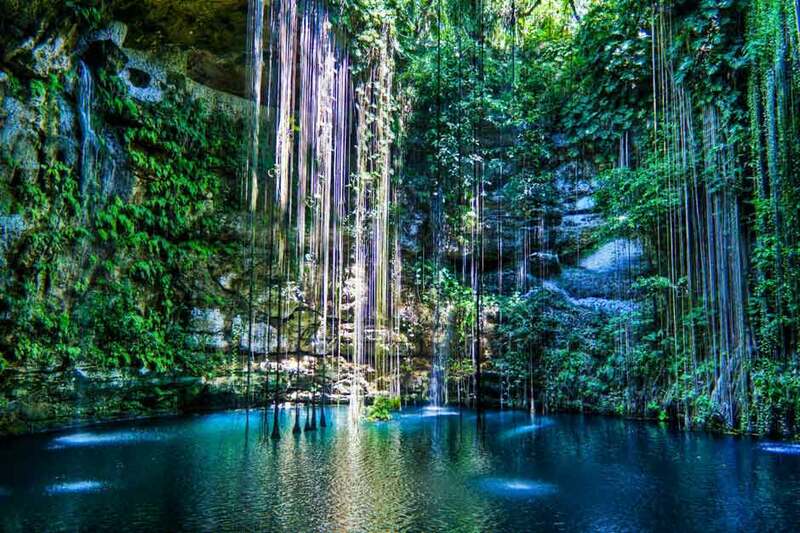 Visit the nearby Eco-Parks: Xcaret, Xel-Ha, and Xplor eco-parks are conveniently located near Tulum. They are perfect for people of all ages. You can discover Mexican traditions and natural richness at Xcaret Park, snorkel with amazing tropical fish species at Xel-Há natural aquarium, and fly over the jungle on the zip-lines at Xplor. 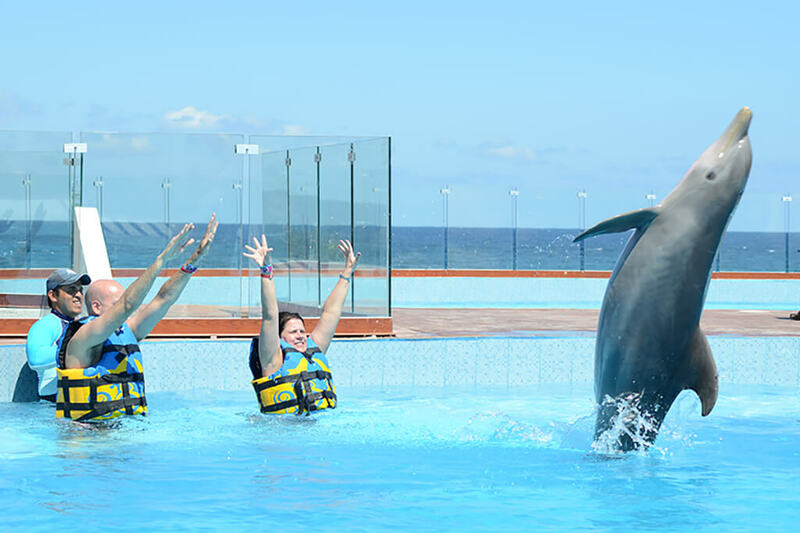 Xel-ha is an all inclusive park where you can enjoy water activities, ecological attractions, swim with dolphins at delphinus, and admire the best scenery. Xplor is the best adventure park as here you can do zip-lining, underground rafting, hammock splashing, and ride an amphibious vehicle. 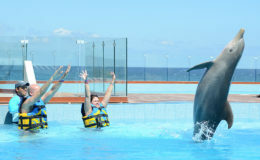 Xcaret park is famous for snorkeling at the reef, sea trekking, swimming with dolphins, and various cultural attractions. Snorkel in and near Tulum: Tulum Reef is a nice snorkeling spot, located in front of the Tulum beach. You will find a coral seabed, relatively rich in underwater life, with some areas colonized by sponges and purple sea fans. Expect to see sergeant major, several species of grunts, butterflyfish, parrotfish, barracudas, sea turtles, stingrays and more. After that you can head to Akumal Bay for getting an interesting snorkeling opportunity of Caribbean reef and marine life. Akumal Bay is famous for its sea turtles, rays, spotted eagle rays, lobsters and colorful corals. Half Moon Bay is another good snorkel location in Akumal Bay; it is also famous for turtle encounters. Fishing: This area is well known for deep sea fishing. You can catch many species of fish including Bonefish, Wohoo, Permit, Snook, Snappers, Jacks of various sorts, Barracuda even Sea Bass and Groupers. Sailfish, White and Blue Marlin, and Dorado are quite numerous in the summer months while Wahoo and Kingfish show up during winter season. The saltwater lagoons of Sian Ka’an reserve, located near Tulum area, are also quite popular among fishermen, both for the quality of the fish found here and the region's extraordinary scenery. 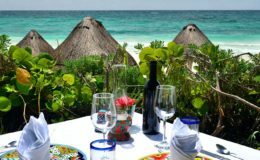 Dining and Shopping: Tulum is the best place to dine, enjoy beverages, and get lost in the beauty of this Mayan beach town. 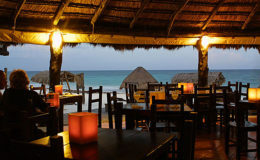 This sandy paradise is famous for fresh seafood, traditional Mexican dishes and authentic Italian food. 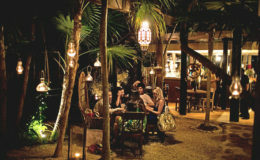 A trip to Tulum is incomplete without dining at some of these restaurants – Hartwood, Gitano, Zamas, Casa Malca, Casa Jaguar, and Posada Margherita just to name a few. 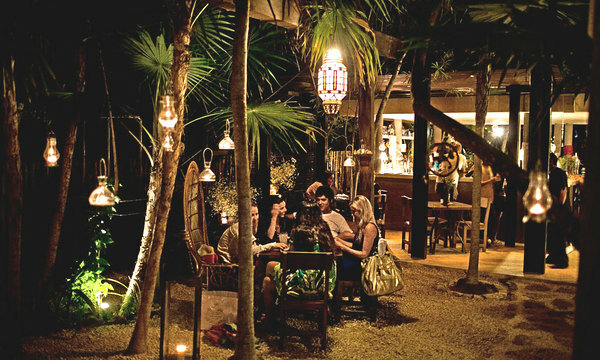 Once considered a sleepy town, Tulum is now a fashionable holiday escape. From designer shoes to beachy cover-ups to traditional crafts, Tulum has plenty of local boutiques and shops to satisfy your holiday shopping spree. Some of the most stylish spots for shopping include Josa Tulum, Hoki Poki Kana, De La Rosa, Wanderlust, La Troupe, and KM33. If you want to buy artisan products, head to La Llorona and Mixik shops. If you are golf lover, MayaZamá (under construction) will help you enjoy golfing as well as admire the natural beauty. 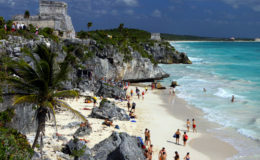 Tulum Beaches: Tulum's pearly-white beach hosts the archaeological site located along its shores. 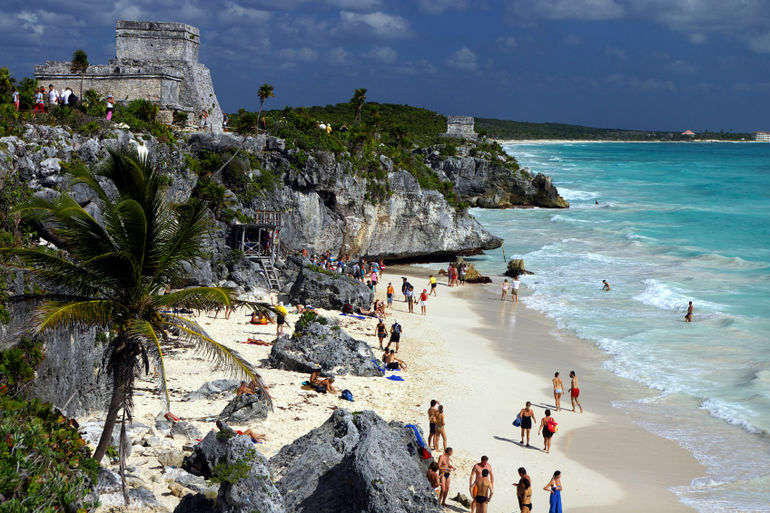 The sandy beach of Tulum is a deserted stretch of sand lined with palm trees and rocks. Long stretches of unspoiled beach allow for leisurely walks, a feeling of solitude and opportunity to admire the ruins. 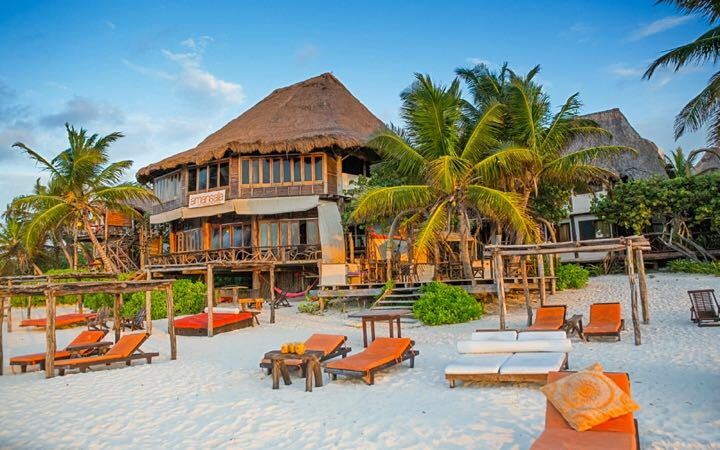 Tulum is a bohemian beach destination, where the sand is finer and the water is ‘bluer’ than other beach towns. 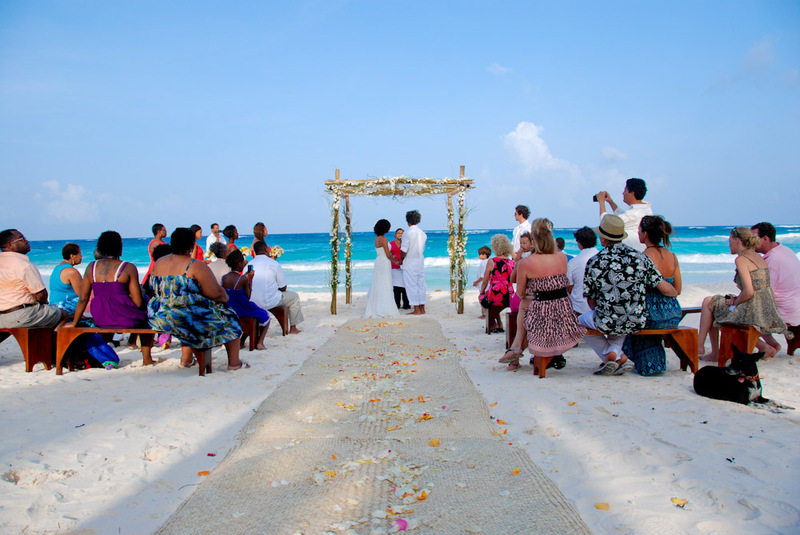 Playa Paraiso is another beach of Tulum that boasts powdery white sand and electric blue waters. 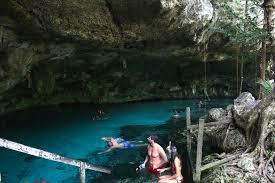 Sian Ka’an: Sian Ka'an is a biosphere reserve in the municipality of Tulum. Visit the reserve to explore its tropical forests, magnificent mangroves and marshes, and archaeological sites of the Mayan civilization including Muyil. It is a perfect place for nature and bird lovers as it is home to more than 300 species of bird. The reserve is home to all 5 of the wild cats - Margay, Ocelot, Jaguarundi, Jaguar, and Puma; 42 species of amphibians and reptiles; 52 species of fish, and other mammals including Tapir, Tamandua, Manatee and Dolphins. 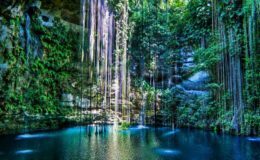 Day Trips: You trip to Tulum would be incomplete without a visit to Chichen Itza that features the best-preserved Mayan ruins in all of Mexico. Near the Cenote Azul, tourists can find this magical marine landscape - Lago Bacalar, where you will get the chance to swim, relax, and dine along the coast. 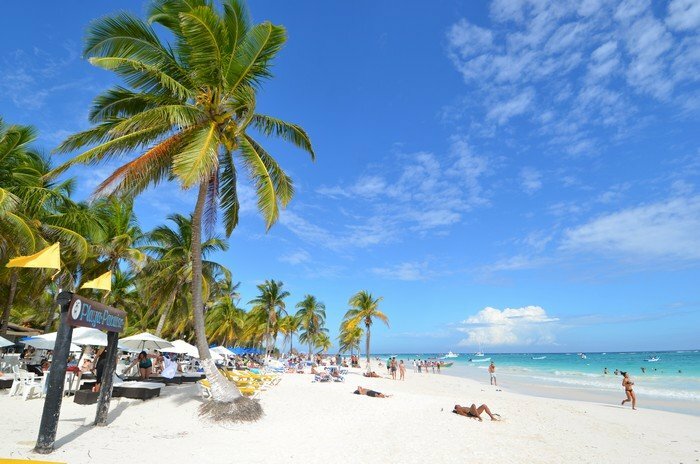 You can take some time to discover the unique attractions of Playa del Carmen during your stay in Tulum. Another destination perfect for your day trip from Tulum is Garrafón Natural Reef Park. This park is best for enjoying cliff-diving, kayaking, zip-lining, and scuba diving. 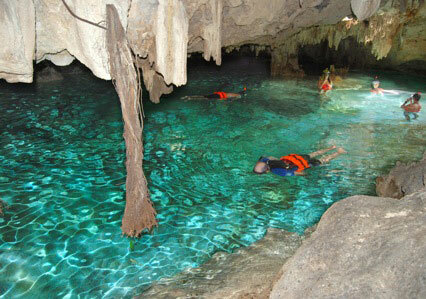 Visit the Cenote Route that boasts large underground caverns and subterranean lakes, ideal for diving and exploring. If you are looking for a whale shark tour, then head to Isla Holbox or Isla Contoy, both are popular for whale watching activity. 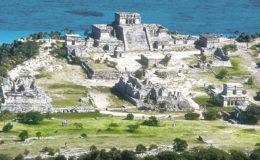 Tulum features ancient Mayan ruins, beautiful beaches, gourmet cuisines, amazing cenotes and plenty of eco-parks. So whether you want to explore Mayan sites or want to enjoy swimming in cenotes, Tulum is great for private yacht charters. Yachts Cancun Luxury Charters has luxury yachts to match all your vacation needs. 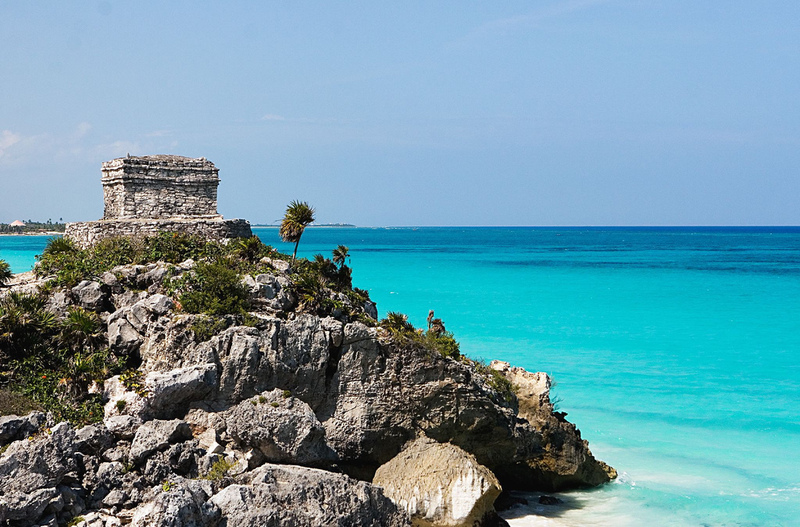 Contact us to find the right yacht charter for your next vacation in Tulum.